Buckets are the center of MoneyWell's budgeting. MoneyWell gives you a default set of buckets when you go through the new document process, but you will probably need to change them as your budget evolves. To edit an existing bucket, double-click on the bucket in the Source list or right-click on the bucket and select Edit Bucket from the menu. Whether it's a new or existing bucket, you can change the settings in the Bucket info popover. Name - This is a required title for the bucket. Memo - An optional description of how to use this bucket. Type - A bucket is either an income or expense bucket. Currency - Sets the default plan currency for every transaction in that bucket. It also drives the currency formatting for the buckets list and reports. Hidden - Toggle the visibility of a bucket in the source list. Tax-related - Tells MoneyWell to use transactions in this bucket for tax-related reporting. 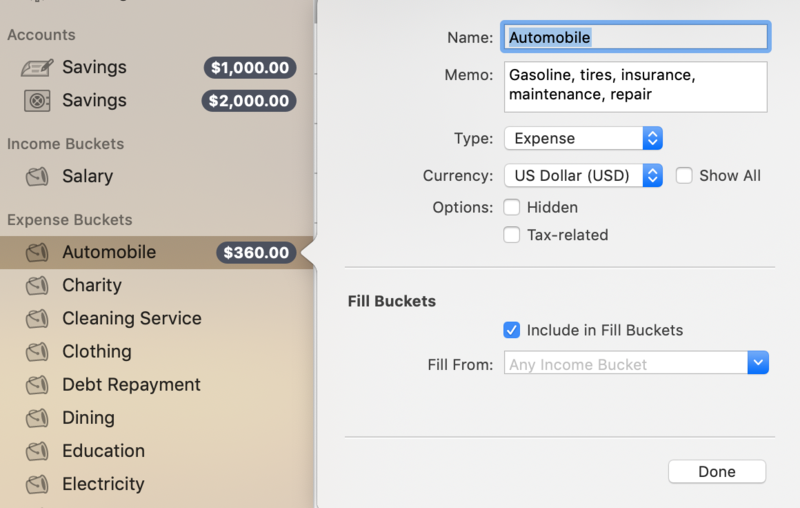 Include in Fill Buckets - Keep this option checked for most buckets if you want the Fill Buckets action to use an income bucket to fill other buckets or to have an expense bucket be filled. If you uncheck this then you will have to manually transfer money between buckets. Fill From - MoneyWell normally fills an expense bucket from any income bucket with money, but you can restrict the fill process to use a specific income bucket for each expense bucket if you'd like.